My Children and I are going to Participate in the Valentine's for Vet's Program this year and we encourage everyone to help participate! A special message of love from our children can help touch a soldier's heart that helped to protect us and defend our freedom! We would appreciate it if everyone could post a link to this blog to help spread the word!! We are so excited to announce the winners of our PeachBlock Giveaway!! Thank you Jamie at PeachBlock for donating all your wonderful items to our readers! Thank you to everyone who entered and for all your wonderful comments that you gave PeachBlock! Please keep their store in mind when you need to purchase a gift for someone special!! Our most popular entries were for the Fruitsy Heart Necklace, Candy Apple Necklace & Cupcake Cellphone charm!! Fruitsy Heart necklace: Bunny B. Here is Ella's Congratulations & Thank you message!! Hi Wonderful Glitterful Blog Readers! I got an email from a Mom looking for some advice from our readers! If you could please post any advice for her in the comments below it would be greatly appreciated!! Thank you!! I know you are a busy mother of three but I was wondering if can you post on your blog a request for any advice on toothpaste. My little guy hates toothpaste. He gags with the mint (whether its' bubble mint, fruit mint, anything). The only toothpaste that I found that he will tolerate is the grape toothpaste from Oral B however, it is so hard to find (In fact if I find it i will buy a case load).Do you have any suggestions for a fluoride toothpaste that taste great but not minty ? Thank you to everyone who posts their advice! It's time to celebrate with Bloggy Giveaway's Carnival!! one 11 x 14 Flannel Board and two Felt Board Stories!! Glitterful Felt Stories "Chicka Chicka Boom Boom Felt Board Story"
Glitterful Felt Stories creates wonderful handmade Felt Board Stories! These stories are high quality Felt Story pieces that can be used to help make story time interactive for your children while reading their favorite stories and songs! They can help create a passion and a lifelong love for reading!! Felt Board Stories have been being used for over a century to help teach children! You can use these with your children at bedtime, story time or while on the go! It is our passion to encourage every child to develop a love for reading with our Glitterful Felt Board Stories!! This contest is open is residents worldwide! Tell us what you like about us! Become a Follower of our blog.....we love our followers! Comment something on our facebook page! Good Luck! Have fun reading with your children tonight!! Mom Most Traveled is having an Adoption Celebration! Since we have two wonderful adoptive children we were so excited to donate some felt story products to this wonderful event! While you are there you can read about our wonderful adoption story of our sweet love Ella! Ps. We will also be hosting a giveaway on this blog in two days!! Come back on the 26th!! This is my favorite London Broil marinade recipe!! I make this at least once a week and the meat has such a wonderful flavor! I always use my left overs to make steak sandwiches the following night! Combine all the ingredients into a freezer Ziploc bag and mix. Then add the steaks. In a Pyrex (just in case the marinade leaks) refrigerate overnight. The next night grill your London Broil and slice thin!! I have some more Babies R Us Coupons that are available Free to you...first come first serve! I have five coupons, so if you want one please blog below with the coupon you want!! These coupons are valid from 1/19-1/29!! GLITTERFUL FELT STORIES FREE FELT STORIES GIVEAWAY COMING SOON!! We are going to be having a fun giveaway from our online store: Glitterful Felt Stories!! Make sure and check back!! Our contest is going to run January 26th - February 9th!! Come back on January 26th to enter to win your favorite felt board story!! 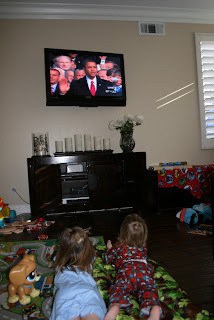 MY KIDS WATCHING THE INAUGURATION OF PRESIDENT OBAMA!! 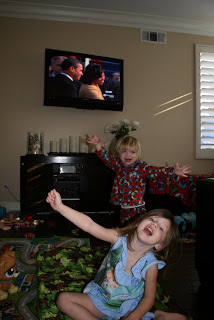 My kids had so much fun watching the Inauguration this morning! When Obama came out Tyler said, "WoW!" They have been cheering and chanting for Obama all day!! 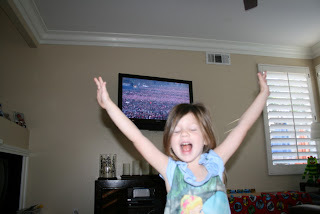 It was great to see a two and four year old excited about this amazing day in history!! They dropped all their toys and watched the whole time! You can see Ella's excitement!! 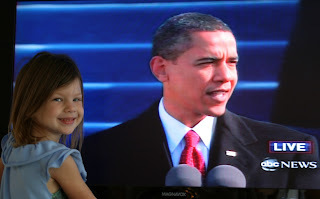 Ella of course had to have her picture taken with Obama!! MY EXPERIENCE WITH THE FREE MAKE-UP SETTLEMENT OFFER! ~ WHAT A FUN DAY!! I had such a great day!! I was able to watch the Inauguration with my two kids and was amazingly inspired!! When it was done I was off with my dear friend Karen (who I adore) to our local department store to get our free make-up!! We had no idea what to expect...only knowing that we qualified for free make-up! We ended up having the best time together! It seemed like every women from Orange County was at the department stores collecting their free make-up! We had such a great time laughing and talking with all the great women that were in line! The lines were long, but we enjoyed the wait! Macy's was so wonderful that they provided all us women with free drinks that while we waited in line!! It was a major since of "girl power"! The best part is my new free large bottle of Coco Chanel Body creme that I got!! I love it!! After we were done we treated the kids to a trip to our favorite lunch spot....Chuck E. Cheese!! Hope you were all able to take advantage of the free make-up offer!! Remember it may still be available at your local department store....it is until all items are gone! I am sure there are going to be some long lines at your local department store, but if you are like me....I have spent tons of money at these places on these cosmetics! I cannot wait to get my free products!! Go to the link below for details!! Due to a class action lawsuit accusing the stores of conspiring to fix prices because the makeup and perfumes never went on sale. As part of the settlement, retailers are being required to give away $175 million worth of merchandise!! You are allowed to choose one item from a list of 19 items. Some of the brands are Lancome, Clinique, L'Oreal and Chanel. For the full list of stores and free merchandise, visit www.cosmeticssettlement.com. Happy Birthday Martin Luther King Jr.!! Here are two fun songs to honor Martin Luther King Jr. along with your children.....and a super fun art project! I am going to be singing these songs with my children and doing this art project on Monday!! Have a wonderful day celebrating with your children!! He wanted people to be friends and live in harmony. He had lots of love to share. Dr. King had a dream for p-e-a-c-e! He had the whole world in his dream. He had (child's name) and (child's name) in his dream. Let your children sponge paint on the blue paper some clouds. Then ask your child what is their dream for their future! When the paint dries you can write their dream on their cloud!! There are only two days left to enter our PeachBlock Jewelry giveaway!! we are offering extra entries this Saturday and Sunday!! To earn an extra entry.....blog on this "bonus" link....one more great thing you love about PeachBlock!! We Love PeachBlock and we Know you will too!! SAVE THIS IMPORTANT DATE!! FREE BREAKFAST AT IHOP ON FEBRUARY 24TH!!! Well...this was an important date that I wanted to blog early about....so you can save the date on your calendar!! Tuesday, February 24th is National Pancake Day!! Ihop restaurants throughout the United States will invite guests to enjoy a free short stack of Ihop's signature buttermilk pancakes from 7am-10pm. In return, Ihop guests are asked to donate what they would of spent on the free pancakes, or more, to their local children's hospital. To learn more then please go to http://www.childrensmiraclenetwork.org/ Their goal in 2009 is to raise $1 million. Girl Scout cookie's disappear fast so don't miss out!! Preorder your yummy favorite Girl Scout cookies today. If you don't know of a local Girl Scout then here is the information to order! I wanted to share this great recipe with everyone!! You can make your own crayons into really fun shapes!! You will need to purchase a muffin tin with the shape of the crayons you want to make. They have star shapes, flower shapes, etc. Your local craft store is a great place to purchase one! This is a great idea for birthday party favors!! For my daughter's birthday I am going to make the rainbow crayons, put them into a clear bag and tie them with a bow!! They should make fun education party favors!! I will post some pictures next month when I make them!! Place peeled crayon stubs in the muffin tin, filling to 1/2 inch from the top of each muffin mold. Turn off heat when crayons have melted, but do not remove tin! Tap bottom of tin to make the crayons pop out. To maintain the rainbow effect, do not move the muffin tray until crayons have cooled completely. If colors mix while hot they become one muddy color instead. Our weather has been amazing here in the OC this week! We have been having temperatures in the 80's all week! Since we live five minutes from the beach we had to go enjoy this wonderful weather!! 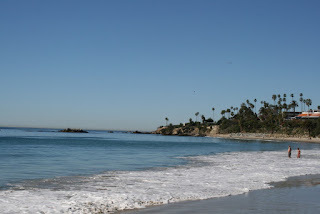 We have a beautiful park that is situated right on the sand! We also made a stop with the famous Laguna Beach Bird Man!! The water was so clear and for the first time in forever we could see Catalina Island!! 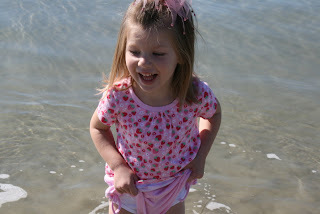 Here are some fun pictures of Ella and Tyler playing in the water!! Ella and the Birds, he will pose the birds in many ways creating wonderful pictures!! 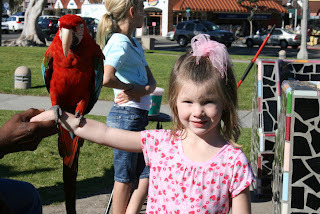 If you come to Laguna Beach....you must visit our famous "Bird Man". I love coupons and I hate for them to go to waist!! Although my children love Build-a-Bear, the last thing we need is another stuffed animal in our house!! So, I have one $5.00 Build-a-Bear coupon that is good towards any animal priced $10.00 or more! This coupon is free.....and first come first serve!! Be the first to blog in the comment below and it is yours!! With a little touch of fate I met a wonderful artist and store owner named Jamie. She has a very popular online store called PeachBlock! She creates beautiful pieces of art out of clay and turns them into beautiful jewelry, hair pieces, and charms. My daughter Ella has a love for jewelry, so I purchased a cupcake charm bracelet and necklace for her. We were both in shock when we opened the package to reveal the prettiest jewelry we have ever purchased!! Jamie made them custom to perfectly fit her wrist and neck. 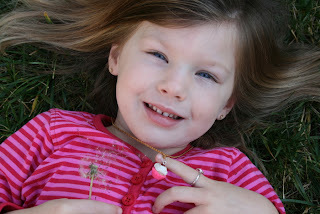 She even included mini cupcake charms for her necklace in different colors for Ella to change them with her attire! Since Ella got these pieces....she has not gone a day without wearing them! She loves them and keeps begging me to buy her more! When you hold her jewelry in your hand you will be amazed at the amount of detail, time and love that goes into each piece! She is an amazing artist! We would highly recommend Peachblock to all our readers! They would make wonderful gifts for children's birthday parties, and office co-worker, a Mother or a special friend! They make wonderful gifts that every girl would love!! PeachBlock has so generously donated many of their wonderful items for a giveaway!! Please leave your email address to be contacted if you are the winner!! Become a follower of our blog! Good Luck!! Thank you PeachBlock for your generous donation!! Ella said, "Make a wish....hopefully you will win"
MY FAMILY VISITS LAS VEGAS!! FUN THINGS TO DO WITH KIDS IN LAS VEGAS!! My family just finished up a super fun three day trip to Las Vegas! My husband is a very busy businessman and can only usually take small trips to avoid missing work. 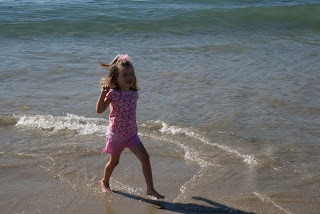 Las Vegas is one of our funnest little quick getaways that our family likes to take! This was our first time going to Las Vegas in the winter. We usually go in the summer and spend the entire time at the pool. Coming in the winter allowed us to see all the fun things to do with kids in Vegas!! We stayed at the Wynn hotel's new tower The Encore! 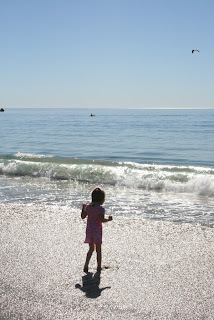 It is a beautiful new hotel that does not seem kid friendly...but they were fantastic at accommodating our kids! They brought special kids baskets up for them with toys and amenities. Ok, so....here are all the fun things that we did with our kids in Vegas! They have built a new monorail (similar to the one at Disneyland) that goes to both sides of the strip. Our kids loved it! We took so many trips back and forth on it. It saved our feet from walking and the kids had fun doing it! We went into the MGM Grand and they have a wonderful Tiger exhibit. You can walk through tunnels with sleeping tiger's right over your head!! They do a presentation for the children where they talk about the tiger's....very educational!! The M&M factory!! A big hit with my kids!! They ran through the four flights of the factory amazed by all the M&M creations. We got to see how they are made and watch a free 3-D movie! They have tons of video game places. Good and Bad. Good-the kids have fun. Bad-super expensive! We went to circus circus and I could not get out there fast enough!! So, we went over to the Gameworks....which was much better!! They have a fantastic shark aquarium exhibit at Mandalay Bay that my children loved!! A must see!! At Paris hotel we took an elevator to the top of their Eiffel tower! It was a beautiful sight to see and the kids stayed up at the top for over an hour looking at everything below! Of course there are lots of shows outside the hotels....Volcano at the Mirage, Pirate Show at the Treasure Island and the water show at the Bellagio. They are all wonderful and fun to watch! The highlight of our trip was going to the Hoover Dam! It was the most amazing sight to see! The kids spent hours looking at all their educational exhibits and they learned so much about history. A must for your kids!! I have added some of my favorite pictures to share with you! Please share your favorite kid friendly activities in Vegas in the comments below! My daughter Ella at the M&M factory....her favorite! A super cool picture from our Hotel window! My childhood favorite....that we found was back on our way there! GLITTERFUL FELT STORIES OFFERING FREE SHIPPING ON FELT STORIES!! Our store is now open after our long winter nap! This is a great opportunity to pick-up your Valentine's Day and St. Patrick's Day Felt Board Stories with Free Shipping!! This offer is only valid on our main website!! With the New Year here.....one of the most common resolutions is to diet and eat better. I recently got this recipe and made it for my family last night!! It was delicious and only 210 calories!! Since My husband loves to go to Alaska to fish quite frequently.....we always have a huge freezer full of fresh fish. I am always in search of new fish recipes that the whole family will enjoy!! To prepare the salsa, whisk lime juice and honey in a medium resealable container until well combined. Add mango, cucumber, onion and Jalapeno, and stir until well blended. Seal the container and refrigerate for at least 1 hour to let the flavors meld. Season with salt to taster. Serve cold or at room temperature. To prepare the salmon, mix cumin, 1/2 teaspoon salt and pinch of cayenne in a small bowl. Lightly mist both sides of salmon fillets with olive oil spray. Sprinkle the spice mixture evenly over both sides. Place a small nonstick skillet over medium-high heat. Cook the fillets until the outsides are just lightly browned, 1 to 2 minutes per side. Then lower the heat to medium and cook until the salmon is a pale pink throughout, 2 to 3 minutes per side. Season with more salt, cayenne and black pepper to taste, if desired. Transfer each fillet to a plate. Top each with equal portions of the salsa. Peach Block has so generously donated a large amount of items for a giveaway to our readers!! Make sure and come back on the 8th to enter and see all their beautiful products!! FREE LOS ANGELES CLIPPERS TICKET FOR STUDENT ACHIEVEMENT AWARD!! 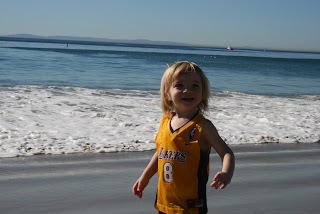 We have Free Ticket's to a Los Angeles Clipper's Game! The tickets are for a student that you know and deserves to be honored for their commitment for excellence in the classroom. It has to be for a student in the greater Los Angeles Community. The certificate that you will get will need to be filled out by you and sent into the Los Angeles Clippers to get your free ticket. It also comes with an award certificate for you to give to the child. Seat locations are processed by the Clippers and are on a first-come, first serve basis and is subject to availability. Please get your form from us ASAP and send it in ASAP. Thank you for taking the time to help honor all the wonderful hard working students of the greater Los Angeles community! !